Set on the outskirts of the Yorkshire Dales, this year’s annual ‘Proms on the Farm’ has been said to be the best yet. 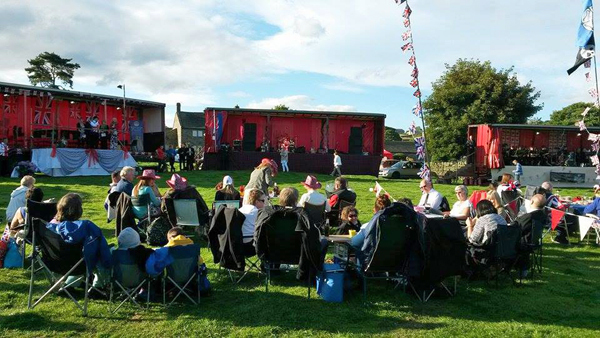 An estimated 1,000 people came together on Sycamore Farm, Brunthwaite, on Saturday 18th July 2015 for the charity extravaganza. ‘Proms on the Farm’ began 12 years ago as a small event trying to raise money for local charities and every year becomes more popular. Over the years the event has raised over £100,000. Event organiser, Rosalie Holroyd said, ‘ It was absolutely fantastic and we had more people than ever there’. She continued, ‘The atmosphere was just wonderful. It was a lovely evening and everybody was sitting outside their gazebos, which had been beautifully decorated. People are already asking when next year’s will be’. The concert was opened at 7pm by the Lord Mayor of Bradford, Councillor Joanne Dodds and the award for the best-dressed gazebo went to the Simpson family – as characters from the Channel 4 cartoon series ‘The Simpsons’. 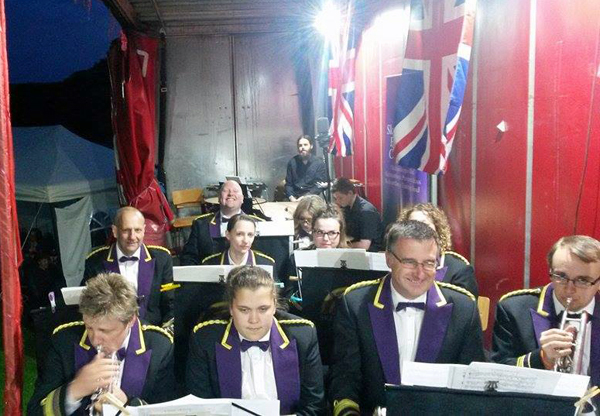 The ‘Proms on the Farm’ concert has become an annual event for The Skelmanthorpe Band and along with its guest singer/soloist, Sarah Halstead, the night’s musical entertainment featured the swing and rock bands, ‘The Sultans of Swing’ and ‘The Big Bang’ respectively. The event also included an auction and raffle. At around 10.30pm and once again joined by its guest singer/soloist, the band began its proms aspect of the event, playing well known tunes including Sir Henry Wood’s ‘Fantasia on British Sea Songs’, ‘Jerusalem’ with music written by Sir Hubert Parry and closing with Sir Edward Elgar’s, ‘Pomp and Circumstance’. From the audience’s cheers for more, it was clear that no one was disappointed in the band’s performance. Having tendered his resignation just a few days earlier, sadly, this was to be Martin Hall’s last concert as the band’s Musical Director. The band’s spokesman for the evening, tenor horn player, Paul Oldfield, on stage thanked Martin for the last 18 months as MD and presented him with a parting gift.